Wow!! I've been on a roll this morning!! 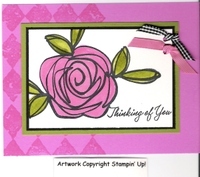 :-) Here's another card I did for the Splitcoast Stampers Sketch Challenge. I picked my colors based on the Ribbon I used!! I am a bit color challenged, so I always need a starting point! Good morning!! 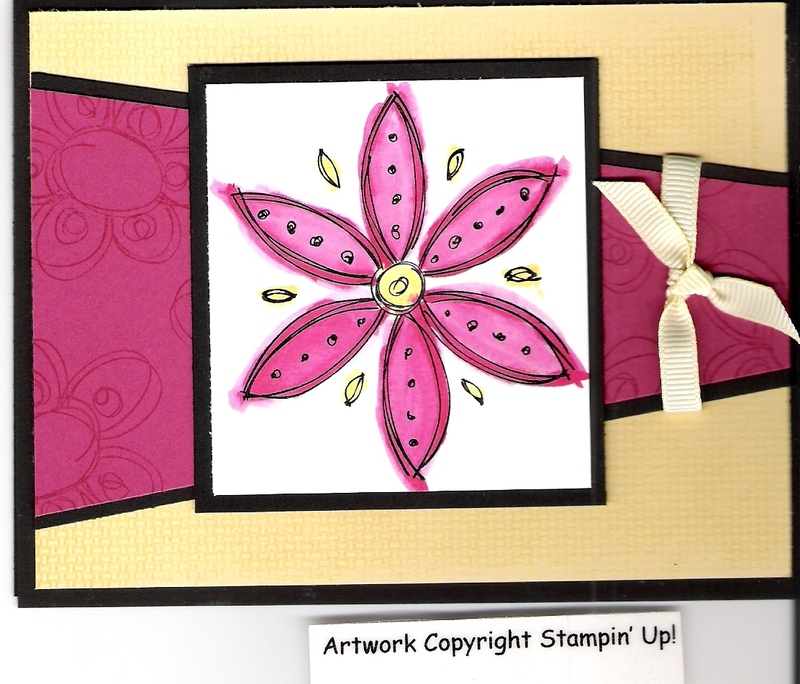 Here is the card I made this morning for the Splitcoast Stampers Sketch Challenge!! You can see the sketch here. Misc: Prep School Ribbon Originals & Hodgepodge Hardware. 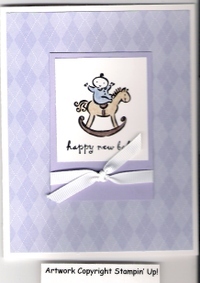 Here's another card we made at our class last night! 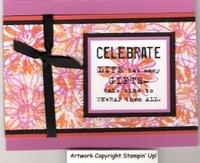 This one uses Petal Prints and That's Nice Stamp Sets. Misc: Black Grosgrain and SNAIL adhesive. I copied this one right out of the catalog!! 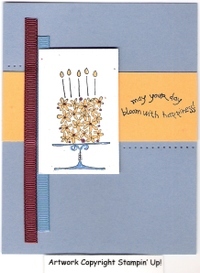 The fun thing about this card is that I had make my own markers for the Marigold Morning and Cranberry Crisp! All you do is take a blender pen and add some of the ink refill to the tip!! Voila! You have your own In Color markers!! Hope you're all having a great weekend!! We're off again tomorrow for another whirlwind of baseball!! Two games tomorrow, four on Sunday, and one on Monday!! But, I absolutely love watching the boys play, so I don't mind at all!! Guess what the UPS man brought yesterday!!! My brand-spanking new Palette O'Prints!!! They are GORGEOUS!! The pictures on the website do NOT do them justice!! I can't wait to show them to you!! What are they?? This is a 48 sheet pad of 6x6 double-sided designer papers!! There are different patterns and colors, and I love them!! You will, too!!! Here is a card I made last night for my husband. Well, he asked me for it--a co-worker's wife just had a baby, and he's in charge of the gift and card! Misc: White Grosgrain Ribbon & SNAIL adhesive. Hi everyone!! I hope you all had a great weekend!! Mine was busy--had two club meetings! It was fun though--even with a cold!! I'm home from work today because of the cold--it just won't go away! My upline is having a monthly meeting this coming Sunday, and I've joined her swap. She's in Ohio, so I don't get to attend the meeting, but I enjoy participating in the swap--these ladies are very talented!! 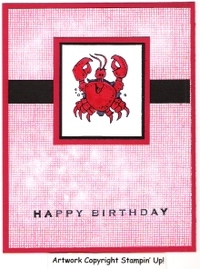 My card is pictured below. I got the idea from a card I saw here. I used the same colors, but changed it a bit. 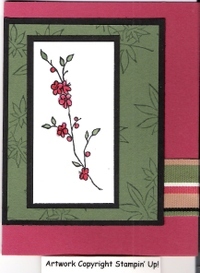 Stamp Sets: DD Mixed Bouquet, Print Pattern Background & Warmest Regards Ink: Pixie Pink, Old Olive & Black Stazon; Cardstock: Pixie Pink, Old Olive, Basic Black & Shimmery White. Misc: 1/8" hole punch, black gingham ribbon and rose grosgrain ribbon. Hello all!! 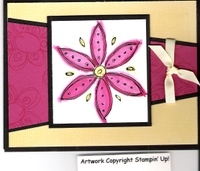 Here is another card I did for the Splitcoast Stampers Sketch Challenge (#119). Ink: Tempting Turquoise, Old Olive & So Saffron. Just a reminder--if you'd like to receive updates from this blog, just fill out the block on the right with your email address!! Hello all!! I have been working hard on projects for my two club meetings this weekend! 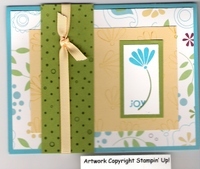 But, I did manage to do a card sketch challenge on Splitcoast Stampers--SC118. I was very happy with how it turned out!! 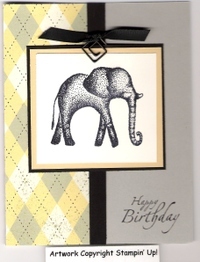 Stamp set: Doodle This & Aida Cloth background. Ink: Black Stazon, Rose Red & Barely Banana. 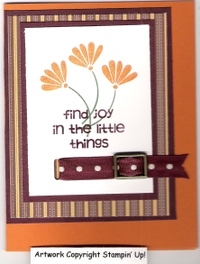 I used So Saffron on the background stamp--it showed up a little better than Barely Banana.